The sound-money principle has two aspects. It is affirmative in approving the market's choice of a commonly-used medium of exchange. It is negative in obstructing the government's propensity to meddle with the currency system. Governments can only wring so much money from their citizens through taxation without inciting civil disobedience, so they make friends with bankers, who have a way of making money appear from nowhere. The money they create isn't sound, but almost no one cares. For politicians, it's sound enough; it provides them with claim tickets to market wealth, which is all they want. Sound money would not cooperate in this manner. It does not emerge from central-bank policy decisions. The classical gold standard is often cited as an example of a sound monetary system. It may have been the best system ever devised, but it existed at the pleasure of government — it was, in other words, a fiat gold standard. As Guido Hulsmann has written, the international gold standard was a cartel agreement between governments. Cartels protect the interests of cartel members at the expense of nonmembers, including the general public. By the early 1880s, the countries of the West and their colonies all over the world had adopted the British model [under which gold was made a monopoly legal tender]. This created the great illusion of some profound economic unity of the western world, whereas in fact the movement merely homogenized the national monetary systems. The homogeneity lasted until 1914, when the central banks suspended their payments and prepared to finance World War I by the printing press. Governments and bankers hate gold because its supply cannot be inflated on command. They work hard to establish and retain a monetary system under their control that can respond quickly to their demands for inflation — or what today is called "accommodation." World War I provides a tragic case in point. The ones who profited from the war had little in common with the men who fought it. The fighting was left mostly to young conscripts, many millions of whom were killed or wounded. The ones who profited knew their way around Washington. If monetary sovereignty had resided with the market instead of with government, the war would not have been fought. Or if it had started, it would have ended much sooner. Sound money had to die before men could die in such large numbers. When war got underway in August of 1914, the European belligerents immediately stopped redeeming their currencies in gold and started issuing debt. Needing a lucrative market for their bonds, England and France selected the House of Morgan in the US to act as their sales agent. The money acquired from bond sales then returned to Mr. J.P. Morgan when the governments purchased war materials, rewarding him with commissions on both the sales and the acquisitions. Furthermore, many of the companies with which Morgan did business were part of his own vast domain. Morgan offices at 23 Wall Street were mobbed by brokers and manufacturers seeking to cut a deal. The bank had to post guards at every door and at the partners' homes as well. Each month, Morgan presided over purchases which were equal to the gross national product of the entire world just one generation before. 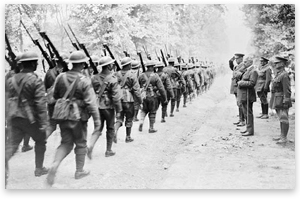 The United States became the arsenal of the Entente. Bound now by financial as well as sentimental ties to England, much of American big business worked in one way or another for the Allied cause. … The Wall Street Journal and other organs of the business elite were noisily pro-British at every turn, until we were finally brought into the European fray. As casualties grew by the thousands — soon to be millions — the belligerent powers chose to fight on rather than rethink the war. Both sides beamed propaganda at their own people and neutrals. The Allies were much better at it. Rulers everywhere framed ambitious "war aims." The war saw massive state-building at the expense of civil society, individual liberty, and free markets. Each state "planned" its economy. To justify the sacrifices, governments promised new social programs. (Death now, equality later?) "War socialism" became the order of the day. Labor leaders served on economic planning boards. Inflation hid the war's monetary costs. Historian Howard Zinn reports that "In the first three months of war, almost the entire original British army was wiped out." As the war stalemated on the Western Front, men on both sides were dying by the tens of thousands for a few feet of scorched earth. To the commanding generals, conscripts were sacrificial fodder. In July 1916, British General Douglas Haig ordered eleven divisions of English soldiers to climb out of their trenches and move toward the German lines. The six German divisions opened up with their machine guns. Of the 110,000 who attacked, 20,000 were killed, 40,000 more wounded. … On January 1, 1917, Haig was promoted to field marshal. In the trench warfare of World War I, the dead never left the scene. The line of trenches stretching from Switzerland to the English Channel was littered with the remains of perhaps one million men. … Those buried would reappear during bombardments, and be reinterred, at times to help support, quite literally, the trenches in which they had fought. Many soldiers recalled the stench of decomposition, and the swarms of flies on corpses, especially during the summer months. Everyone execrated the rats. Even with Britain imposing a starvation blockade against Germany that eventually killed 750,000 German civilians, the Allies were in danger of losing the war. Using a fleet of newly developed submarines, Germany was destroying Allied shipping at the rate of 300,000 tons per week. By war's end the U-boats had sunk over 5,700 ships. In early 1917, the Allies were facing the prospect of asking Germany for peace terms. For Wall Street, peace was not an option. With the possibility of Allied bonds going into default, investors would incur a loss amounting to $1.5 billion. Commissions, as well as the profits from selling war materials, would be lost. The Treasury could make direct grants to the Allies, but only if the US abandoned its "neutrality" and entered the war. Following Wilson's address to Congress, it did so officially on April 6, 1917. The Morgan cash flow was thus saved. The United States extended the Allies' credits(which reverted back to Morgan to pay off loans), income taxes surged — especially on the wealthy — and the Fed inflated. Between 1915 and 1920, the money supply and prices roughly doubled. Federal deficits were running a billion dollars a month by 1918 — exceeding the annual federal budget before the war. The government ran the economy, establishing prices and priorities while commandeering entire industries, such as railroad, telephone, and telegraph. The term "civil liberties" was synonymous with treason; people were encouraged to spy on their neighbors, and censorship was everywhere. "The government's reign of terror against 'pro-Germans' targeted all who doubted the cause," writes Stromberg. "So many snoops helped that H.L. Mencken suggested medals." In California, the police arrested Upton Sinclair for reading the Bill of Rights at a rally. In New Jersey, the police arrested Roger Baldwin for publicly reading the Constitution. countless incidents of intimidation, physical abuse, and even lynching of persons suspected of disloyalty or insufficient enthusiasm for the war. People of German ancestry suffered disproportionately. In the first ten days after the war declaration, only 4,355 men enlisted; in the next weeks, the War Department procured only one-sixth of the men required. Yet Wilson's program demanded that we ship a great army to France, so that American troops were sufficiently "blooded." With the country's youth showing no interest in dying or killing for corrupt politicians, Wilson decided to bring out the bayonets. On May 18, 1917, he signed the Selective Service Act to register over 10 million men, from which over 2.8 million were drafted. In an apparent bid to make himself and his administration the inspiration for Big Brother, Wilson added that the draft was "in no sense a conscription of the unwilling; it is, rather, selection from a nation which has volunteered in mass." "Volunteers" who didn't register got a year in prison, and anyone found obstructing the conscripting process was subject to a $10,000 fine and 20 years in prison. According to Wikipedia, World War I killed over 16 million people, counting both soldiers and civilians. Another 21 million were wounded. France lost half its men between the ages of 20 and 32. The war cost over 117,000 American lives, and left another 205,000 wounded. The psychological toll on the survivors is beyond comprehension. A sound monetary system could have turned the foregoing narrative into fiction. Without the covert funding inflation provides, the conflict would have been little more than a warmonger's pipe dream. What did all the suffering and death bring to the world? Soviet Russia, Adolph Hitler, Keynesianism, World War II, the Cold War, the Iron Curtain, and much more — including financial institutions too big to fail. War, whether hot or cold, became a lucrative racket. used their own governments to subsidize their operations and produce enormous profit. Both arms makers and bankers were active in handing out subventions to the press in order to shape public opinion in needed ways. Perhaps most importantly, the interests of both groups lay in a cycle of conflict. The arms makers needed conflict for huge demand … [but] they also needed bouts of armed peace or cold war to upgrade technologies and sell their new goods. The bankers likewise needed conflict as a way of financing governments' war efforts overall, forging all kinds of ties with those governments, and gaining government help in crushing their business rivals or taking them over. Yet times of peace were especially important for bankers, because even greater profits were forthcoming from reconstruction efforts after a conflict was over, counted then not by millions but by billions. If the belligerents' banks had not been protected by government privilege, the public would have pulled their gold out. With massive taxation too risky, the four-year war would have been over in four months. Without the means to pay for it, the political class would have been denied their war. Fractional-reserve lending and the abandonment of gold opened the doors to the slaughterhouse. opened the doors to the slaughterhouse." During the 17th and 18th centuries, maritime pirates would frequently fly the Jolly Roger to frighten their victims into surrendering without a fight. The skull and crossbones superimposed over a black background represented death and plunder. When Nixon closed the gold window to foreign governments in 1971, the dollar became a pure fiat-paper money, ideal for legal piracy. With a fiat-paper dollar under control of its central bank, the US government and connected corporations can raid the wealth of dollar holders and fund a world empire through bribes, intimidation, and war, while the large commercial banks can inflate to their advantage, knowing that the Fed can and will create enough dollars to bail them out of trouble. The dollar itself still bears a close likeness to the paper medium that once circulated as a substitute for real money. How much more honest today's dollar would be if it bore the mark of the Jolly Roger. George F. Smith is the author of The Flight of the Barbarous Relic, a novel about a renegade Fed chairman, and Eyes of Fire: Thomas Paine and the American Revolution, a script about Paine's impact on the early stages of the Revolution. Visit his website. Send him mail. See George F. Smith's article archives. Great article and so true. It's extremely curious when you look throughout recorded history and find the very same people every time, time after time, offering to lend kings and governments vast amounts of money for the purposes of waging war. Odd, that. All this borrowing and lending is responsible for so much death and misery all through the centuries. In light of your article it's interesting that World War I started just 6 months after the creation of the Federal Reserver. All that easy/phony money floating around looking for a home and goverments and business all to happy to spend it. I think without the FED it's unlikely we would have had such big wars or military spending this past century.